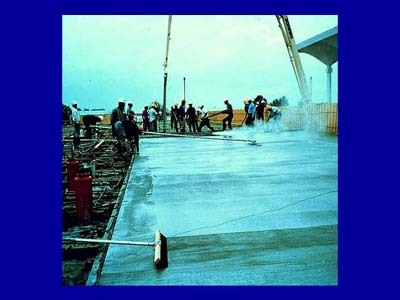 Fast-track or one-pass finishing of silica-fume concrete flatwork. The entire placing and finishing process is completed in one step as shown in this slide. Here, the concrete is being placed, consolidated, floated, and textured in one pass. Curing compound is being applied immediately following the brooming pass. More information on one-pass finishing is presented in Chapter 4.